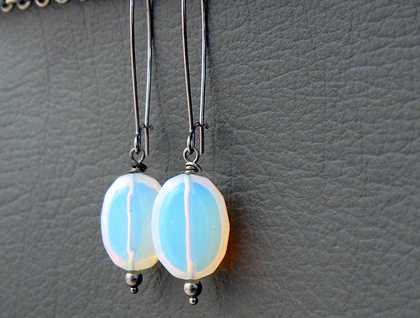 Stunning ovals of sea opal are wire-wrapped and suspended from gunmetal-black ear-wires. Beneath each sea opal bead is a small, smooth, metallic black bead, adding a graceful finish to this simple earring design. 'Sea opal' is actually man-made glass, cleverly fashioned to imitate natural stone with its tiny imperfections and inclusions. 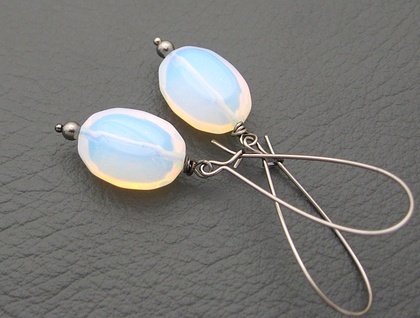 At first glance, the sea opal glass sometimes appears to be frosted white; but it is actually translucent, with a glowing, milky, blue-green hue, almost like moonstone. In certain lights, flashes of orange appear. The brighter the light, the more vivid the colours. At times the glass appears to be radiant with fiery oranges, golds, turquoises, and blues – very like real opals in colour. Unfortunately, the soft lighting used in the photographs, which is necessary to avoid harsh shadows, does not show the stunning flashes of colour. These remarkable glass beads are shaped like puffed ovals, with soft-edged facets. Clicking on the largest image will enable you to view the photographs at full size. 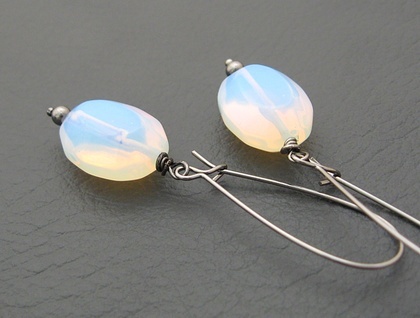 The 'Sea Opal' earrings measure 59mm from top to bottom. 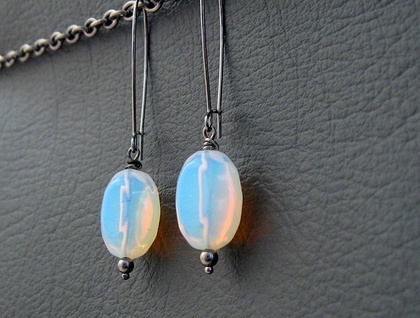 From the bottom of the ear-wires, the drops are 26mm long, while the 'sea opal' beads are 13mm wide. The gunmetal black ear-wires are copper based and are without nickel. Keeping the earrings hanging, rather than jumbled up in a jewellery box, will help to ensure that the ear-wires do not get opened or bent by other jewellery pieces pushing against them.